Lola, Megan and Maizie have been voted by their peers to be responsible for encouraging others in their class to use Welsh phrases throughout the school day. Each week the school has a new Welsh phrase of the week to encourage all learner's and staff too to use. 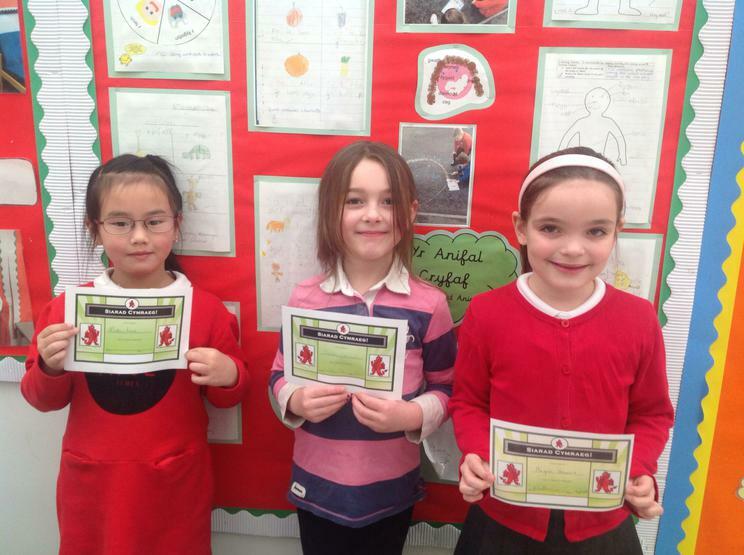 Each week a pupil who has used the most Welsh from each class will be awarded with a Seren Cymraeg certificate. 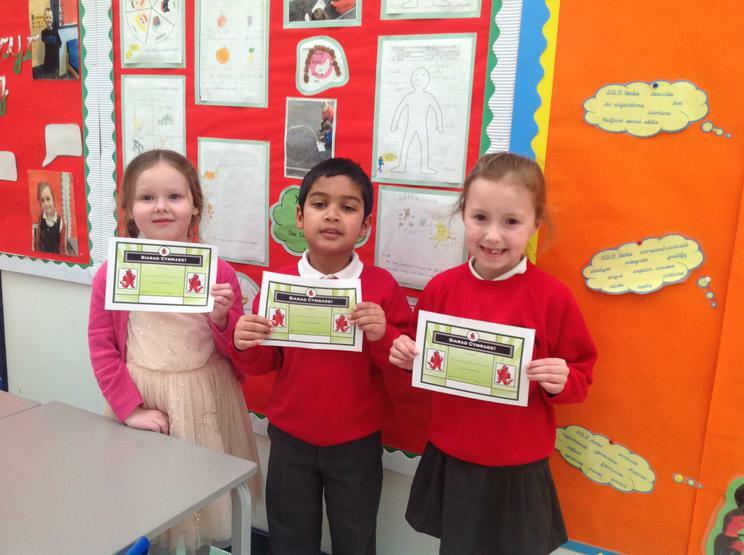 Congratulations to the children below for making every effort to speak Welsh whenever they can. 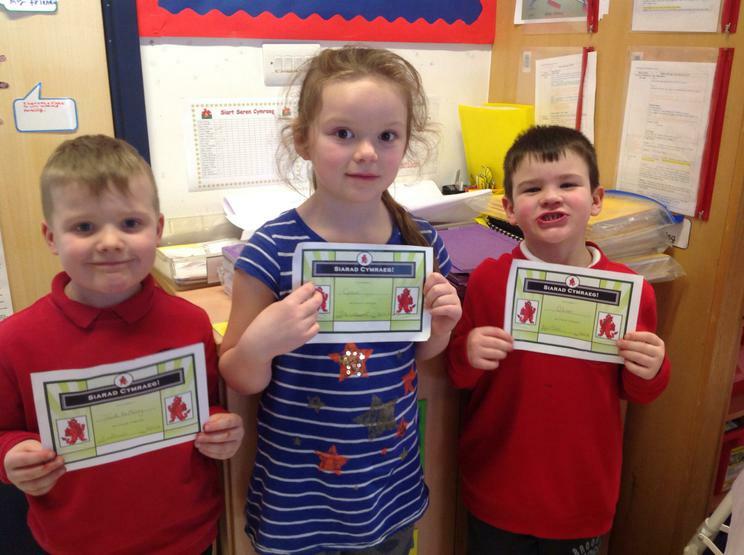 Click on the powerpoint below to see the new Seren Cymraeg winners added each week! A positive start for Jayden Brinson this week as he starts the new year winning a seren cymraeg award. Da iawn Jayden! Big smiles for Millie as she breaks up today for Christmas after hearing that she had been the lucky winner whose name had been picked out of the hat from all the Seren Cymraeg certificate winners in the Autumn term. Well done Millie, da iawn! Bendegedig to Tegan today as she discovers she is a winner of the Nadolig Cymraeg colouring competition. Take a look at her amazing entry! Well done. Congratulations to Millie Jones for winning this weeks Welsh Star certificate. Keep on using Welsh and let's see who the Welsh Star's will be next week.